In his column Surf AXA, surfer, filmmaker and LargeUp contributor Ravi Lloyd shares stories and photos from his home island of Anguilla. See more Surf AXA here. I knew the week of March 5th was going to be amazing. The swell charts from Tobago to Maine were all going off, and Anguilla was right in the middle of it all. My brother, Akio, and I linked Jovial and Lulu from the jump. There are six local surfers in Anguilla, if we are all on island at one time, and Jovial is one of them. Lulu is a good friend and neighbor I always ask to take photos of us surfing. Fun fact: Most of our surf pictures don’t have anyone surfing in them simply because there aren’t enough surfers. The swell was actually on from Sunday the 4th — a huge, 3.5-meter northwest swell. To say the least, I was too amped and the swell came in with tons of wind. Blown out and bummed, we started to head east, when the biggest surprise came from on top the hill. “BRO! Ting there Rendezvous, boy!,” I yelped to my brother as I was driving. The swell was so big, it was wrapping the entire island. A rare wave came in on Rendezvous Bay. I have only seen that in pictures and never in person. We had to make it out to the south side of the island. The scene over on Rendezvous Bay. Immediately, we had to get in the water. I shot some pics from the shore: Here is one of Akio catching one from the point. Just beautiful, Rendezvous Bay at sunset. We surfed Rendezvous for a few days and it was amazing. Clean off-shore winds, good size, and of course no one was out — just Jovial, my brother and I. By Wednesday, the swell had cooled down a bit, and winds as well, and we were able to head back to our usual spots on Meads Bay. The first day was just huge, breaking from the point and pure stoke. We caught some from the outside. Photo by Akio. Clean days at Meads Bay. Photo by Akio. Jovial getting down the line on a fun one. Photo by Akio. 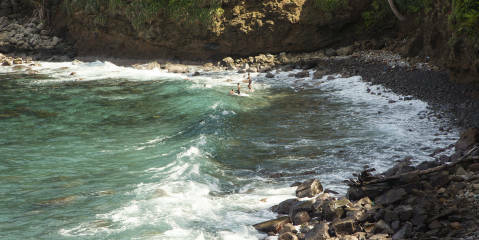 Thursday was the best day — Good size with offshore winds on Meads Bay.We surfed all afternoon. Photo by Akio. Check us out in Island Harbor. We are building a rum shack and surf shop! Look out for more updates soon. ‘Till then, check out our tees in the LargeUp store.